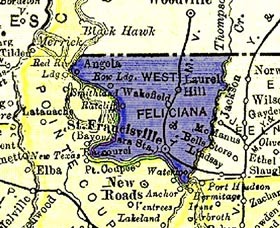 Welcome to the West Feliciana Parish LAGenWeb Project. This website is affiliated with the USGenWeb Project which is a group of volunteers working together to provide free genealogy websites for genealogical research. This Project is non-commercial and fully committed to free genealogy access for everyone. My name is Allen Herring and I’m the Parish Coordinator for West Feliciana Parish. Please feel free to contact me with any questions you may have regarding this site, the records contained within or general genealogy questions.